"the zoological garden, like the botanical garden emerges from Assyrian hunting parks (c1350 BC) in fiction from the mythological topos of Paradise (pairidaeza) shared yet differently interpreted by both Islam and Christianity. Whilst there is evidence of collections of animals in Egyptian and Chinese gardens, it is the Garden of Eden, which underpins modern western zoological and botanic gardens. The first modern botanic garden is attributed to the Padua University (1543), although it can be traced to Aristotle's Lyceum. The inclusion of collections of animals in gardens for mere spectacle can be most illustriously ascribed to the Romans who developed aviaries and menageries but the seminal menagerie design was that of Le Vau for Louis 14th at Versailles in 1663." Fig.1. 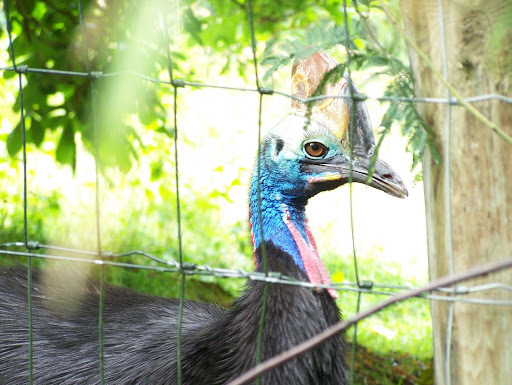 Jeremy @ picasaweb, 1 August 2008, 'Cassowary at Edinburgh Zoo', Scotland. 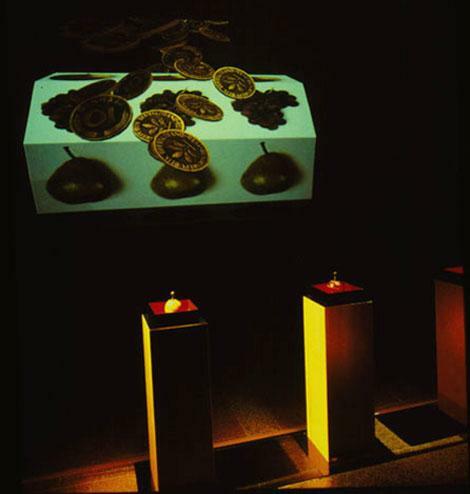 This interactive installation, similar to video games, was presented simultaneously at IC' 93 in Tokyo and Multimediale 3 at Karlsruhe, linked up by the digital ISDN network, the player in Tokyo could join up directly with a player at Karlsruhe. In order to bring together the two halves of the same object, the two players had to co–ordinate their movements and interactions visually, within the virtual space of the game. The work centres–on a virtual 'fruit–machine' that is controlled by users communicating via a ISDN network.The fruit–machine metaphor references the Paradise parable.